Christmas: Pagan to the Core! "Holiday." For most people the word is applied to one celebration in particular . . . Christmas! The definition of the word "holiday" reveals a religious element of which many people are unaware. Christmas is a religious holiday. Despite all the commercial trappings of the modern celebration, Christmas remains, at heart, a religious festival. It is a time when a deity is remembered and honored. Christians celebrate the birth of Jesus at Christmas time. They exchange gifts in honor of the "greatest gift ever given." They say: "Jesus is the Reason for the Season!!" and speak of putting the Christ back into Christmas. The problem is, Yahushua the Saviour was never "in" Christmas to begin with! While Scripture does not supply the Saviour's birth date, most scholars agree that He was born in the fall, not December 25! To discover the god being honored at Christmas, it is necessary to trace its pagan origins. Celebrations on December 25 began shortly after the flood with the birth of Tammuz as the reincarnation of Nimrod. Today's Christmas traditions come directly from ancient Babylon and pagan Rome. The pagan Romans honored the god, Saturn, with a week-long festival in December called Saturnalia. Saturn was the Roman god of time and of the harvest, so he was usually depicted holding a scythe. He was the cruelest, most evil of all the pagan gods. He demanded child sacrifice. The Romans were not alone in worshipping this evil god. Worship of Saturn was prevalent in the ancient world. Even the Israelites worshipped Saturn when in rebellion against heaven. The god Israel most frequently worshipped when in apostasy, was the god Saturn, (referred to in the Bible as Chiun, Molech, or Remphan.) Even the Israelites offered their children in sacrifice to this vile, blood-thirsty god. Although the Romans quit offering human sacrifice early on, blood was still spilled by the gladiators during the Saturnalia celebrations in December. Saturnalia was a religious celebration and all understood that the blood shed by gladiators was a sacrificial offering to Saturn. Despite the violence and bloodshed, Saturnalia was a time of feasting and merry making. The various ancient celebrations honoring this most blood-thirsty god have come down to today as the much-beloved Christmas traditions celebrated the world over. Even the imagery of Father Christmas, or Santa Claus, bears a striking resemblance to Saturn: an old man, with a long beard, surrounded by children. Saturn, the evil, child-sacrifice demanding old man, appears in modern society in two more guises. Every December, Saturn, the god of time, reemerges as "Old Father Time." Baby New Year is a symbol of the child-victim. 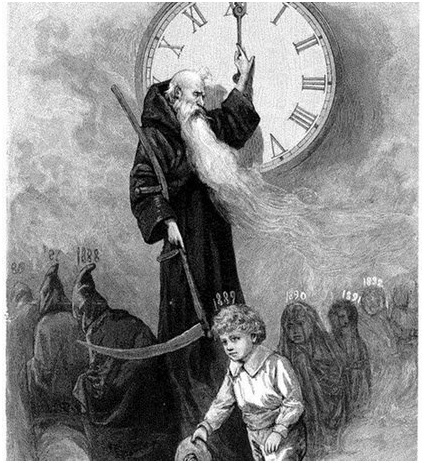 A chilling representation of Father Time with Baby New Year can be found in this illustration from the 19th century (below). Father Time, (Saturn, as the god of time), is standing in front of a large clock, holding his scythe. The old years are passing away as full-grown bodies wrapped in burial shrouds. The New Year is coming in as a young child. While the picture is quite dark, light from the fire is lighting the little boy while on either side are swirls of smoke. The new years still to come are portrayed as children ready to be sacrificed. Victims of child sacrifice were always heavily veiled so that their parents would not recognize when their child was burned. All the grotesque elements of this hideous god are contained in this picture. Saturn also emerges in modern society as the Grim Reaper, gathering in his bleak harvest of souls. 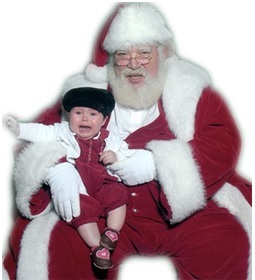 Very few in modern society have recognized that Father Christmas, the Grim Reaper and Old Father Time are none other than this most loathsome of all the gods. However, an ancient would immediately recognize them all as being none other than Saturn. The emblems which identified Saturn are the same which identify Old Father Time and the Grim Reaper: scythes and something to mark the passage of time. "Christmas is a wonderful time for spending with family. We are so busy throughout the year this is really our only chance to get together." "Christmas is a great time to witness! People are more open at this time of year so I use it as an opportunity to share." "Christmas is the only holiday that really focuses on Jesus!" The pagans were ignorant of Yahuwah, the Creator. They worshipped demon gods because they did not know any better. The same cannot be said of Christians today. To know that Christmas is a pagan holiday, to know that the modern rituals are identical to the ancient pagan rites that honored Saturn, and yet to claim exemption from sin because one knows, is extremely inconsistent. Christmas is truly a holiday: a religious festival. By honoring the evil god, Saturn, DIShonor is given to Yahuwah, the Creator of Heaven and Earth. Saturn, more than any other false god, had attributes most similar to Satan himself. Christmas is his religious festival. Participation in Christmas celebrations gives honor to this evil, satanic deity. Participation in pagan traditions dishonors the Creator. Return to your loving Redeemer. Come out from among them! Do not touch what is unclean!! Spring is the best season of the year for many people. Warm sunny days; the earth, springing forth with new life. Flowers, budding trees, baby animals: all seem to joyfully announce that the long cold winter is over. No other Springtime custom encapsulates these celebrations of new life quite like Easter. From baby animals, to Easter eggs and Easter egg hunts, to sunrise Sunday services and more, Easter is a beloved tradition to many people. Easter Sunday is the highlight of the Roman Catholic liturgical year when the resurrection of Jesus Christ is celebrated. 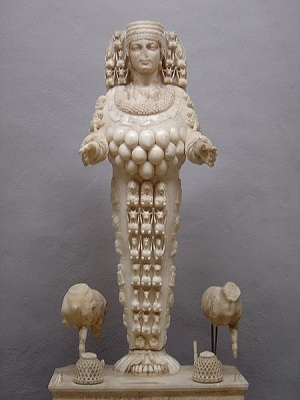 Artemis of Ephesus (Semaramis in one of her many guises). 1st century CE Roman copy of the cult statue of the Temple of Ephesus. Statue in the Museum of Efes (Turkey). Note: She is clothed with eggs. The origins of Easter, however, reveal that it flows directly from ancient paganism. 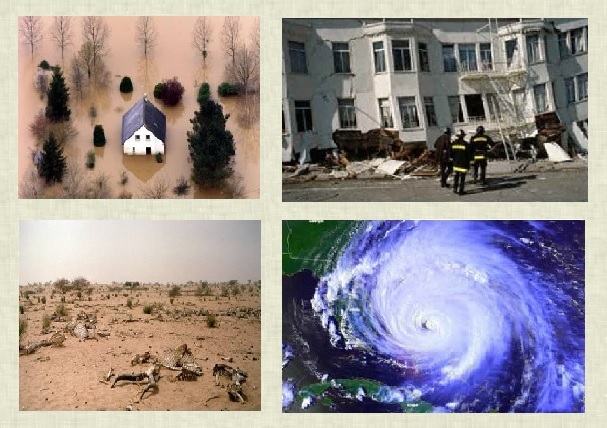 Shortly after the flood, Nimrod reestablished idolatry in the earth. After his death, Nimrod was promoted as the original sun god. His widow, Semiramis, was called the "queen of heaven." Various cultures continued the idolatry of these original pagans under different names. To the Egyptians, Semiramis was Isis. To the Babylonians, she was Beltis, consort to the god, Bel. To the Cannaanites she was Astarte. The Assyrians called her Ishtar. The worship of these goddesses involved occult fertility practices. These degrading rites were practiced even by the Israelites when in apostasy. Yahuwah clearly denounced any Israelite involvement in these pagan celebrations. Modern Easter has no basis in the pure religion of Heaven. All of its traditions are pagan. 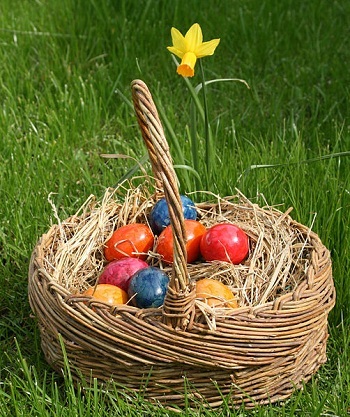 Rabbits and dyed Easter eggs symbolize fertility. Hot cross buns were the "cakes" offered to the queen of heaven. The forty days of weeping for Tammuz are now the 40 days of Lent leading up to Easter. Sunrise services were performed by pagan priests to honor the sun god. Celebration of Easter does not honor the death and resurrection of the Saviour. Participation in pagan practices honors Satan. No amount of renaming it by Christian names can purify Easter of its pagan origins. Easter is much more than a pagan imposter pretending to be Christian. Lurking behind the pretty facade, Easter is a cover-up for the greatest fraud of all time: a calendar change which hides the true day of the resurrection and the true seventh-day Sabbath. As the years passed and the first Christians died, paganism began to corrupt the once-pure faith. The Church in Rome, greedy of ever greater power, sought ways to increase her influence. This change of calendar also changed the day of worship. This is admitted by Roman Catholics who point to it as the sign of their authority. The Jewish festival which was outlawed in favor of Easter was Passover. All early Christians kept the feasts of Yahuwah as outlined in Leviticus 23. Paganized Christians still wanted to celebrate Easter while apostolic Christians, still clinging to a pure faith, observed Passover. Here is the real significance of Easter. Sunday is kept as a day of worship because of Easter Sunday! It is claimed that the Saviour was resurrected then. Consequently, it is assumed that the day before Easter Sunday, Saturday, is the seventh-day Sabbath. The Jews point to the extreme persecution following the Council of Nicea's decision to set aside Jewish time calculation as the reason for why they no longer use the Biblical calendar. Jewish scholars understand that Christianity stepped free of its Biblical roots when the pagan Easter was substituted for the true Passover. "At the Council of Nice [NicÃ¦a] the last thread was snapped which connected Christianity to its parent stock. The festival of Easter had up till now been celebrated for the most part at the same time as the Jewish Passover, and indeed upon the days calculated and fixed by the Synhedrion [Sanhedrin] in JudÃ¦a for its celebration; but in future its observance was to be rendered altogether independent of the Jewish calendar. The truth is, Easter is a fraud. It is not the day upon which the Saviour arose from the grave nor is Saturday the seventh-day Sabbath of the Bible. 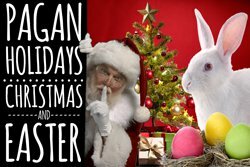 Easter is and has always been a pagan holiday celebrating fertility. It was substituted for Yahuwah's Passover at the Council of NicÃ¦a in the fourth century when the Church of Rome decided to set aside Hebrew calculation of time. Now, in this last generation, truth is to be restored. All who wish to express their gratitude for the death of their Saviour will commemorate it on the day upon which He died: Passover. This can only be calculated by the original calendar of Creation. Any other observance gives honor to Satan, the one who has set himself up in opposition to Heaven. Today you can choose which day represents your beliefs - Passover or Easter. You can choose to which power you wish to give honor and worship: the Saviour or His enemy, Satan. You can choose on which day, calculated by which calendar, you offer that worship. Halloween - A Covenant With Death And With Hell! When you hear the word "halloween" what images appear? What "spirit" is invoked at the whisper of Halloween? Halloween openly promotes death, devils, witches and flagrant "appearances of evil" (1 Thess. 5:22). Halloween leaves most people scratching their heads questioning, "How and where did Halloween come from"? This article unearths the hellish tomb of Halloween to exhume its sinister "covenant with death and hell." The Druids celebrated two special nights of the year: Beltane and Samhain. Beltane took place on May 1 and marked the birth of summer. Samhain occurred on November 1 and signified the death of summer. Samhain, a night celebrating death and hell, was the Druids most important ritual. It was a terrifying night of human sacrifices. And it was the original Halloween. The Druids believed, during Samhain, the mystic veil separating the dead from the living opened. The Druids taught these roaming spirits loosed on Samhain went searching for a body to possess. The frightened Celts would masquerade as demons, evil spirits and ghosts, hoping to convince the roaming evil spirits, they were another evil spirit, and leave them alone. The Celts also prepared meals as "treats" to appease the evil spirits from "tricks" or malicious acts; hence our custom of "trick or treat." The Druids performed horrifying human sacrifices and other vile rituals during Samhain. Let there be no doubt—Samhain night was a terrifying "covenant with death, and with hell." And let there be no doubt – Samhain was the original Halloween night. The Druids also celebrated the festival of Beltane. The word Beltane (Beltaine, Beltinne, Beltain, Beiltein) literally means the "fires of Bel." Bel is the same god called Baal, found over 80 times in the King James Bible. 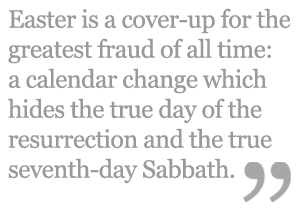 The Lord condemns Baal worship probably more than any other false "god." The Devil glorifies death. Hebrews 2:14 says, ". . . that through death he [Jesus] might destroy him that had the power of death, that is, the devil;" Proverbs 8:36 says all they that hate the Lord ". . . love death." Revelation 6:8 says the rider of the antichrist’s pale horse, ". . . and his name that sat on him was Death, and Hell followed with him." Understanding the hellish history of Halloween—why in the world did decent people so embrace it? What magic "trick" transformed rancid Samhain into the giddy Halloween? As the Catholic missionaries swarmed Britain and Ireland seeking the mass conversion to Catholicism their orders from Pope Gregory in 601 A.D. was to cunningly convert the Druid rituals into Catholic rituals. The Catholics converted the ritual of Samhain into the festival of All Saint’s Day, a day of celebration and prayer to dead "Saints." The Catholic festival of All Saints Day was also known as All Hallows Day, with the word "hallow" replacing "saints." The day before All Hallows Day (October 31) was recognized as All Hallows Eve. Eventually, All Hallows Eve became Hallows Eve; hallow’even; hallow’en and ultimately today’s Halloween. In 835, Pope Gregory IV "blessed" All Saint’s Day as a sacred "day of obligation," consequently on that day, the Catholic Church officially "ordained" Halloween. Halloween owes its very life and breath to the "blessing" of the Catholic Church. Samhain would have breathed its last breath many years ago if not for the "ordination" of the Catholic Church. A perverse and blasphemous twist to Halloween concerns the name "Halloween." The word "hallow" means "holy, sanctify or consecrate." The popular Lord’s Prayer in Matthew 6:9 begins with, ". . . Our Father which art in heaven, Hallowed be thy name. . ." The label "hallow" belongs to God the Father—Hallowed be thy name. Halloween was a night sacrificing young children to the worship of Baal. It is no accident that the name of history’s most hellish night, glorifying "death and hell," wears God the Father’s holy name of "hallow." 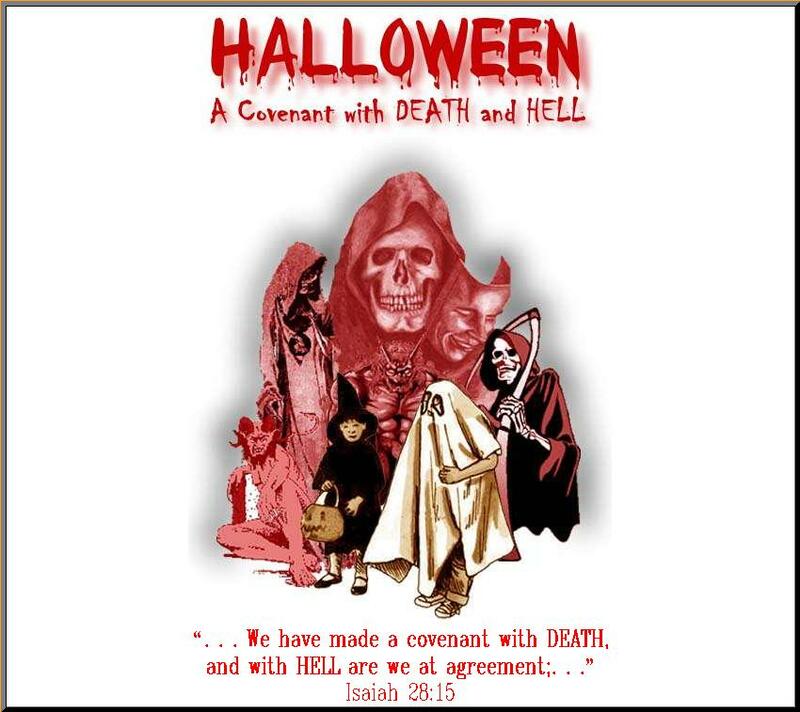 The blasphemous name of "Halloween" clearly bears the fingerprints of Lucifer as found in Isaiah 14:12, ". . . I will be like the most High." JACK-O’-LANTERN: If Witches are the Queen of Halloween, the smiling jack-o’-lantern is the King. The demonic jack-o’-lantern leaves most historians baffled tracing its spooky origin. One popular tale, tells of Jack who tricked the devil in a deal for his soul. But the origin of the jack-o’-lantern is much more sinister. It arrives from the Druid’s ghastly reverence of the severed human head! They proudly decorated their houses and temples with bloody severed heads. The Druids believed the head housed the soul, hence the light or candle in the skull. The original jack-o’-lantern was not a pumpkin or turnip, but a severed human head! MASKS & COSTUMES: Masks and costumes carry a long history in the occult and demon possession. Masks are contacts to the spirit world to invite the spirit to "possess" them. Halloween has always been a night of perversion and inversion—a night where misrule rules and decadence masquerades as decency. Halloween’s "best kept secret" is its romantic love affair with homosexuals. Halloween was the golden key that unlocked the homosexual’s closet of perversion. Halloween’s spirit of inversion, bestowed the homosexuals one utopian night to publicly flaunt their decadence and perversion. The Halloween machine turns the world upside down. One’s identity can be discarded with impunity. Men dress as women, and vice versa. Authority can be mocked and circumvented. (Skal, David J. Death Makes a Holiday: The Cultural History of Halloween p. 17)Halloween has done more for the current acceptance of homosexuality than any other event. Years of huge homosexual Halloween street parades of gaudy perversion and decadence in New York’s Greenwich Village, Washington, D.C,’s Georgetown, New Orleans’s French Quarter and the infamous Castro Street in San Francisco almost single handily detonated the current homosexual explosion. The frightful night of Halloween can be a fruitful night for Bible believing churches! Parents are looking for a safe alternative to Halloween. Have a real "Fall Harvest"! Advertise it; build it up; put some time and prayer into it! Encourage kids to dress up as "Bible characters." Have games and goodies for the kids. And here’s the harvest part: Provide some tables and refreshments for the parents. Have some covert "soul winners" quietly mingle among the parents to converse and tell them of the wonderful Lord Jesus! Some may object such tactics on Halloween as "partaker of his evil deeds" (2 John 1:11), but Christian friend, Satan is "the god of this world" (2 Cor. 4:4); and "the whole world lieth in wickedness" (1 John 5:19) – not just the one night of Halloween! Our days of the week wear the names of pagan gods: Moon-day, Zues-day, Woden’s-day. Thor’s-day, Freyja-day, Saturn-day, Sun-day. Ever look on that dollar bill displaying the satanic all-seeing "eye of Lucifer" in the pyramid? This earth is the devil’s turf (Luke 4:6). You can’t escape his wicked influence. But as David took Goliath’s own sword and cut his head off (1 Sam. 17:51), we can take one of Satan’s "swords" and cut some souls from hell. Use this Halloween as an opportunity for the Lord Jesus. Have you ever received Jesus Christ as your Savior? Not joining a church, not religion, not baptism, not good works, not sacraments — but trusted Jesus Christ and Him alone, as your Savior. If not, Friend you could be — one year, one month, one hour, one minute, one heartbeat — away from eternity in a lake of fire! Friend, don't EXIT this message, until you MAKE SURE you've received Jesus Christ! I assure you — if you die without Jesus Christ — it'll be the biggest mistake you'll ever make! DO NOT TAKE THE CHANCE! Friend, If you've never been saved, don't wait another minute! FRIEND, YOU CAN BE SAVED THIS VERY MINUTE! Lord Jesus, I know that I am a sinner, and unless you save me I am lost forever. I thank you for dying for me at Calvary. I come to you now, the best way I know how, and ask you to save me. I now receive you as my Savior. In Jesus Christ name, Amen.